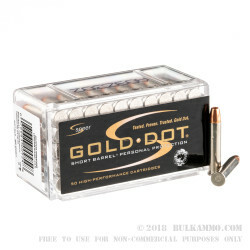 For shooters who want to give their pocket pistols a boost there is .22 WMR by Speer Gold Dot. 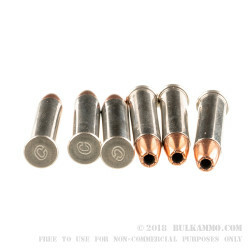 This rimfire-primed cartridge features a smaller version of Speer's most effective self-defense bullet, a 40gr jacketed hollow point (JHP) Gold Dot. The 40gr JHP has the same explosive expansion as larger Gold Dots, and is chemically bonded to prevent jacket/core separation. The .22 WMR is an excellent round for hunting small game and varmint. 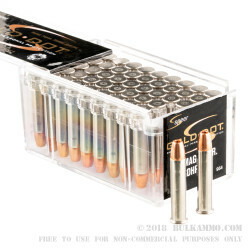 Speer loads these .22 WMR rounds into rimfire-primed nickel-plated brass casings that are non-corrosive and of the highest quality. This .22 WMR has a muzzle velocity of 1050 fps, so it's not a high-power load, but the maneuverability of a small revolver combined with the destructive mushroom formation of the Gold Dot makes these .22 WMR cartridges effective for self-protection.